Around the same time that Kyle was hosting the Central Virginia Blacksmith Guild, Johannah was doing something she's been wanting to do for quite some time: teaching a mosaic workshop at Art 180. This fantastic group provides art-related programs to Richmond kids living in challenging circumstances, and runs a teen art center housed in the Downtown Arts & Culture District. Johannah worked with about eight teens at the downtown center one beautiful summer evening. 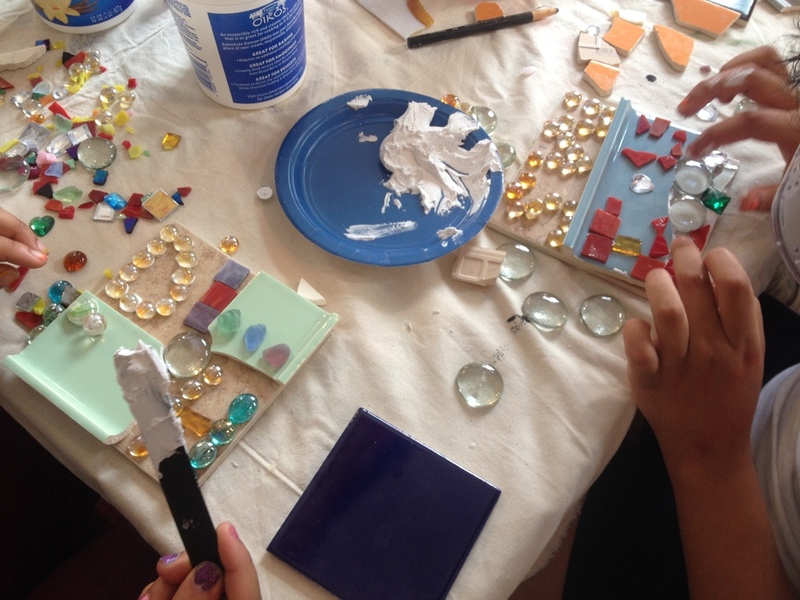 We worked with a mix of stained glass mosiac tiles, glass marbles, ceramic tiles, and reclaimed ceramic dishes. Johannah described a fairly spontaneous method of mosaic-making to the kids, and they ran with the idea. There's so much personality in each and every one of these pieces. Johannah described the technique of stacking tesserae or mosaic pieces, and several put this idea to good use in their work. A few weeks later, we hosted our first Ladies Night at the studios. A small group of women came and spent an evening hanging out, chatting, and making mosaics with Johannah. We used mostly ceramic tile and reclaimed ceramic dishes, as well as shells and glass a few of the ladies brought along with them. We worked in the same spontaneous style Johannah used at Art 180. This is a fun, low-key way to learn the language, tools, and materials of mosaic for the first time. These ladies jumped in to this project feet first. They worked with so much enthusiasm and thirst to learn about mosaic-making. We're looking forward to our next ladies night Intro to Mosaics class this Friday! If you are interested in scheduling a private mosaic class with a group of friends, let's set that up! Intro classes in this spontaneous style are $30, including all tools and materials, for a two-hour workshop in our studios. Contact Johannah at (804) 888-9778 or johannah@phoenixhandcraft.com.